A considerable part of the military history of the 17th century is dominated by the conflict between the Christian powers and the Ottoman Empire. Much has been written about the politics and the campaigns that led to the siege of Vienna in 1683 and the defeat suffered by the Sultan's armies, while, until today, there are relatively few studies on the long war that opposed Venice to the Ottoman Empire. The importance of the event in the context of politics not only of the Mediterranean, but of all Europe, is easily found in the number of chancelleries involved in the war, both directly on the battlefield or in diplomatic negotiations. The strategic duel involved the belligerents in the control of the supply routes, and the metropolitan territory of both sides remained almost excluded from military operations. It was a conflict where the logistics organization and the ability to supply the armies made the difference, similar in many ways to the campaigns in the south-western Pacific during the Second World War. 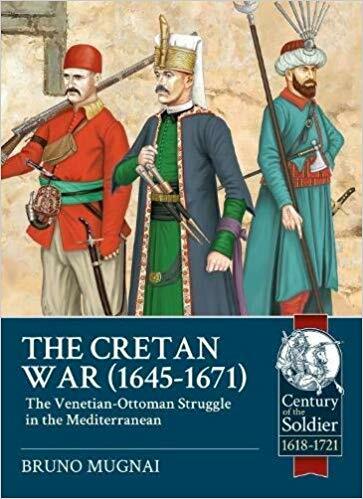 It could be said that the Cretan War was the first conflict of contemporary age, but fought with the means of the 17th century. Other aspects make this conflict a topic of great interest. Just remember that in the last years of war, men from almost all the countries of Europe were concentrated in Crete - and for the Ottomans also from Asia and Africa. Even with regard to the reconstruction of military clothing and equipment, this work finally opens a window on a period not very frequented by researchers, although these are years in which great transformation took place both in the armaments and in the development of new combat tactics. The different types of soldiers involved in the conflict have been illustrated with care in colour plates, based on the most significant coeval examples and employing several unpublished sources.